Flip flop decorating ideas abound when you shop smart. Are your flip flops looking particularly boring? You're not alone, but with a little DIY or a quick shopping trip online, your sandals will be encrusted with plenty of jewels, flowers, delicate doodads, and whatever else you like. All you need to do is pick up your embellishments of choice and apply them to your shoes, which can be in any color you like. Get ready for lots of style when designing your shoes, plus plenty of compliments. It's easy to decorate your flip flops using hot glue or a craft glue, but do you know what to stick on your shoes, and where? Here's what's recommended in the way of flip flop decoration. Purchase quirky doll house accessories like teapots, miniature housewares, and tchotkes, and affix one or two at the front of the shoes with craft glue. Carefully affix an iron-on transfer to the shoe's sole with a low-heat setting. 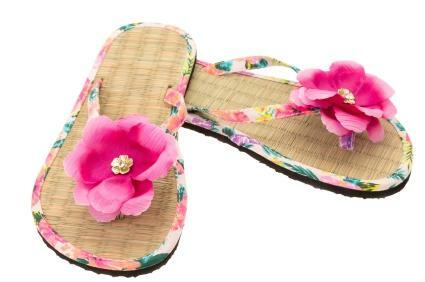 Get a flower from a craft store and use a dot of glue to affix it to the center of the flip flop straps. You can also attach it off to one side for a little asymmetrical flair. Purchase clear elastic and Velcro circles (smallest size) from your local craft shop. You can affix flowers, charms, and buttons to the elastic with glue, and then wrap the elastic around the strap of the shoe. Affix the Velcro together to keep the charm or flower in place. Buy fabric paint to add a tiny monogram to the sole of your shoe, or write something funny. When you slip off your footwear, you'll see what you wrote down on the sole. Purchase permanent markers and add small designs or monograms near the soles or straps of the shoes. Dress up your flip flops for special occasions with a bit of sparkle. Purchase a nautical-style slim cord and use it to tie a macrame-style knot in a decorative fashion. If you sew, you can use a needle and thread to sew the knot on the flip flip strap. Using a heavy-duty thread ensures that it won't break suddenly, and some macrame knots are extremely easy to accomplish with the right book. For those with a little more skill, you can actually sew straight through the rubber of the straps to attach slim cord or ribbon. Wear heavy gloves while sewing, because you will need to use a heavier needle designed for stitching through leather, canvas, rubber, and denim. Wrap wide ribbon around the flip flop straps, leaving a long "tail" at the front of the foot. You can tie the front strap into a bow or decorative knot, and then trim the ends with pinking shears to keep them from unraveling. Use dots of glue in important points to avoid any problems with the ribbon shifting when you are wearing your shoes. Craft glue works best! 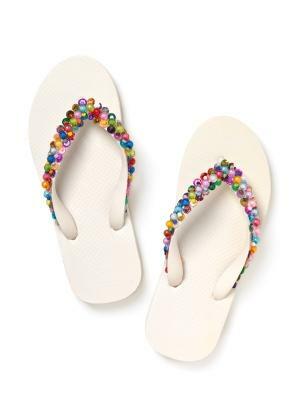 Take small sequins or flat beads and glue them along the straps of the flip flops for easy style. If you choose to use one color, you can actually create the illusion that your sandals have straps in an entirely different color. You can try black, iridescent beads to give a stylish look for night. String a few stylish beads on colorful embroidery thread, and then knot that around the front of the sandals. Experiment with various lengths to keep them from clanging together. Buy pre-strung necklaces and cut them in two. Develop the length you are looking for, and then tie them in a knot on one side of the shoe straps. If you leave a little extra string on the necklace, then it will give you space to tie the string comfortably around the shoe. Sew or knot a small loop of cord around your flip flops, and then clip on charms that feature a lobster claw clasp right on to it. Experiment with your own creativity, too! However you decide to decorate your flip flips, you're sure to let your personality and style shine through.